Protect Projects from Humidity with help from Aprilaire! You’re a DIYer. When the house needs fixing, you pick up a hammer – not the phone. You have the tools, the skills and the motivation. Don’t let humidity take that way! Learn how to protect projects from humidity by following the tips below. Any craftsman be they weekend warrior or full-time contractor must deal with an invisible but damaging variable of home repair – excess or insufficient humidity. Indoor relative humidity impacts your house in many ways, but most noticeably by damaging woodwork, wood floors, cabinets and trim. A lack of humidity leads to cracks, gaps and creaking in wood floors. You may also notice crown molding that is pulling away from the wall or ceiling. This is never a pretty sight, but it can be particularly distressing if you did the job yourself. Work you proudly pointed out at your last Super Bowl party is now an eye sore you hope your friends don’t notice. So how do you protect your projects from humidity? No matter how well you did the job, humidity control is a separate issue. As we all know, trees need water to survive. In fact, a living tree can be up to 50 percent water! Even after that tree is turned into flooring or lumber, moisture will always be a part of its makeup. In the winter, dry air in your home will pull some of that moisture out of the wood causing it to shrink. In the summer, the wood will pull excess moisture out of the air causing it to swell. Neither scenario is good for wood, so you need to control indoor relative humidity. Acclimate: Before installing flooring, trim, baseboard of even hanging a door, allow the material to sit in your home on a flat surface for 48 hours. During this acclimation period you will want the relative humidity in your house to be in a healthy and comfortable range – between 35-50%. 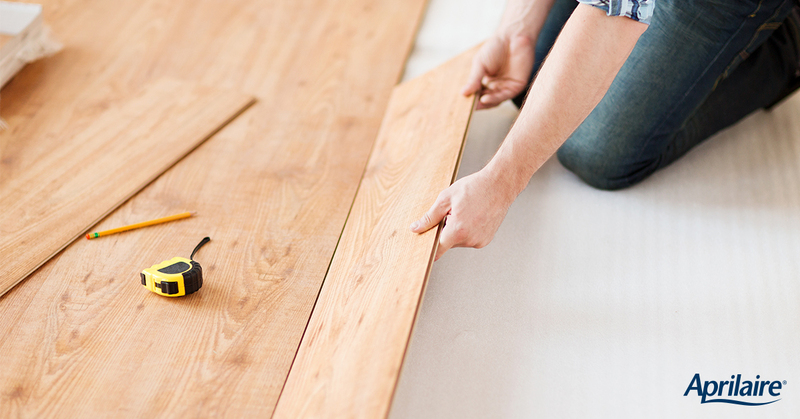 Follow care instructions: Wood flooring products should come with instructions for care. Pay close attention to how they should be cleaned. Wet mopping a hardwood floor can add a lot of damaging moisture to the surface. Control humidity: Whole-home solutions for humidity and dehumidification can help protect the job. Installed as part of the HVAC system, these solutions make controlling humidity throughout the entire house incredibly simple. You will be able to maintain that healthy range of relative humidity throughout the year. A HVAC professional can help you select the right humidification product for your home and make sure its installed correctly. If you’re a master with the skill saw, skilled with a paint brush and a sure shot with the nail gun – it’s time to conquer humidity control in your home with Aprilaire.